With a rubberised grip these pens are a great writing tool! A fine choice for a promotional pen. 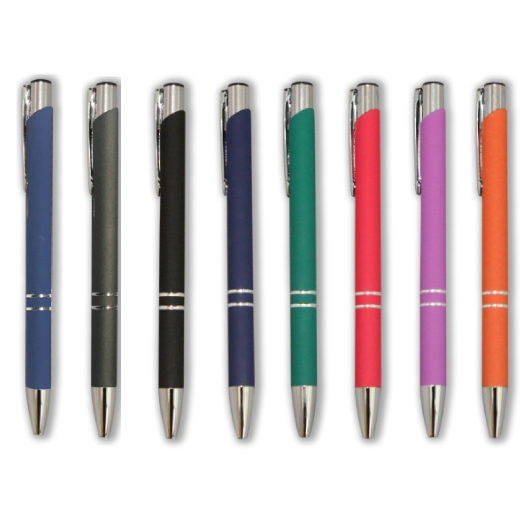 These pens have the same style as the Killara but feature a rubber coated barrel, giving them a unique look and comfortable feel. These pens also have a metal clip and polished chrome plated trims. They come in your choice of 8 fantastic colours and have an extended writing length of 1800m. They also host a Parker style refill with German Dokumental black ink and a tungsten carbide ball.